Try out a new adventure and drive your own Snow Quad in the wilderness of Åre. 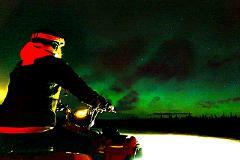 Our guides will take you and your friends for an unforgettable winter driving experience in the Swedish nature. Hopefully we also see some wild animals. Bring your family for an unforgettable winter adventure with our Snow Quads in the wilderness of Sweden. This experience is taylor made for families and includes except for the ride also great views and an outdoor a Swedish “fika”. 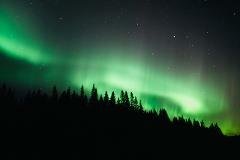 Snowshoe walking in the night with the chance to experience the Northern Lights. An evening snack is included and the guide is also telling facts about the northern lights and how to capture auroras on camera. (Transport included). Our dogs take you on an unforgettable and silent ride into the Swedish wilderness, where we travel by the moonlight and stars until we arrive at our camp and enjoy a traditional Swedish outdoor dinner. (Transport included). Walk amongst with our reindeer friends; Rudolf, Frost, Vide, Sven, and Fred! 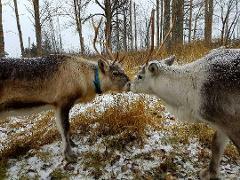 This special tour will give you an opportunity to see an exclusive reindeer show, take some special photos and get comfy around a fire at our Reindeer-ranch. 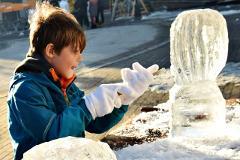 Explore the magical world of ice sculpting and unleash your inner artist while in Åre. We provide you with a block of crystal clear ice and all the the tools to creating your own work of art. Hot drinks made over open fire will be served. Experience the magic feeling of walking on a frozen lake and let us guide you to the parts where the most fish use to bite. We teach you to fish for trout and artic char through a hole in the ice. This trip also includes snacks and coffee. Let us guide you to our favourite places and here present carefully selected delicious locally produced food from the region. During a 1,5-2 hour snowshoe hike, we give you the best of two worlds when we combine the unique food and nature. The Snowbike guarantees pure fun on the slopes. The combination of biking and skiing gives you a totally new experience and during this 2 hour basic course we learn techniques for braking, control speed,turning and how to use the skilift. Rent your ride! The combination of biking and skiing gives you a totally new experience and guarantees pure fun on the slopes. We start with a 30 min introduction and then you have access to the Snowbike for the rest of the day. 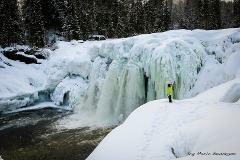 On the Ice Waterfall Adventure, we will take you out to the icy and beautiful Ristafallet. Our service-minded guide will show you to the waterfalls secret spots and ensure you an adventure that you will never forget. Join us on a relaxing hike on snow shoes! They are the perfect equipment if you want to have a easy way to walk on the snow. Let us guide you in the Swedish "fjells" and birch forest. Enjoy rivers, snow covered birches and the view!